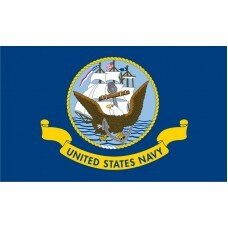 Shop for authentic United States Navy Flags. 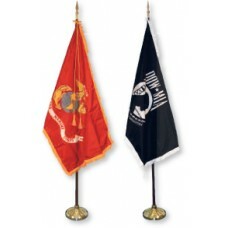 We offer indoor and outdoor Navy flags in nylon and polyester. Our outdoor flags are finished with a canvas heading, while indoor flags are finished with a lined pole hem and your choice of with or without fringe. 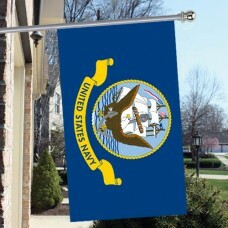 We also offer indoor and outdoor Navy flag sets. The United States Navy is the 3rd largest of the 7 United States uniformed services. It has its roots in the 2nd Continental Congress of 1775, during the American Revolutionary War. That Congress was far from convinced of the benefits of having a standing navy, as the British Royal Navy would inevitably be much more powerful. George Washington pushed for the formation of the US Navy, and eventually convinced the Congress of its merits. He commissioned the USS Hannah, the first designated United States Ship. It had some success, and the Congress commissioned two further vessels. The Continental Navy was established on 13 October 1775. During the Revolutionary War, the newly formed navy had limited success. It was poorly funded, and after the War was over, the Continental Navy had no actual ships. This left the new nation's merchant ships vulnerable to attack, which they were, especially by the Barbary Pirates. Economic damage to the country was such that Congress passed the Naval Act of 1794, which established a permanent, standing navy as of March 24th of that year. Much of the pressure put on Congress to take this action was brought by John Adams, the country's 2nd President. For this reason, Adams is often referred to as the "father of the American Navy." The new service developed quickly and began to have more and more success. This was highlighted in the War of 1812. By the time of the Civil War, or War Between the States, its strength gave the Union forces a major advantage over the Confederacy. The Navy Flag itself has a history of its own. The current design has the Seal of the US Department of the Navy at its center. This consists of a fully rigged ship, an anchor and an American Bald Eagle. On the flag, the Seal sits above a banner reading "United States Navy." These designs stand out against a deep blue background. Although called the Navy Flag, in fact this design is not actually flown by any US Navy ships while at sea. It is used for ceremonial purposes indoors at land based Naval facilities. When at sea, US Navy vessels hoist the US Coast Guard Ensign. 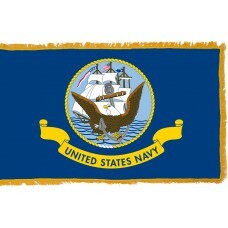 The Navy Flag was officially adopted by the nation by President Eisenhower on April 24th 1959. Before this, the Navy's unofficial flag had been the Infantry Battalion Flag. This was a simple design of a dark blue background and a white diamond shape in the center housing a dark blue anchor. The new Navy Flag was instigated by an Executive Order which set out the dimensions and design of the flag, as well as when and where it is to be flown. The Order also sets out the design of related Streamers which can be added to the flag representing combat honors won in both wartime and peacetime operations. As the US Navy is now the biggest in the world, many of these honors are won during peacetime across the world's oceans and seas.